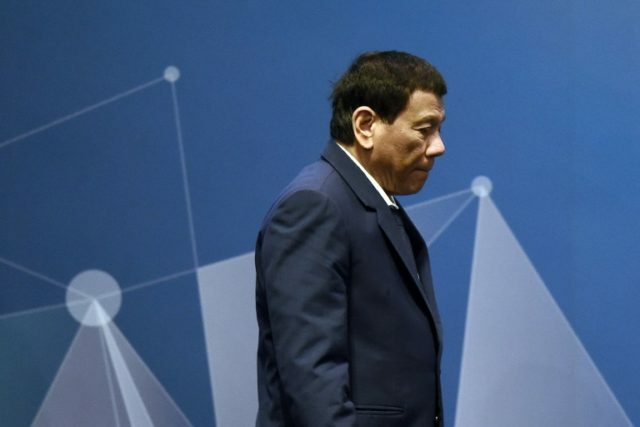 Philippine President Rodrigo Duterte blocked the military from enforcing a 2016 ruling declaring China’s presence in Philippine waters illegal, the nation’s defense secretary told reporters on Friday. Under predecessor Benigno Aquino, the Philippines filed a lawsuit against China at the Permanent Court of Arbitration at the Hague, arguing that China’s invasion and colonization of the South China Sea, particularly its construction of artificial islands in the Spratly and Paracel island chains, violated the United Nations Convention on the Law of the Sea (UNCLOS). The court ruled in the Philippines’ favor and ordered China to evacuate sovereign Philippine and Vietnamese territory. Shortly after the Hague ruled for China to withdraw, Duterte ordered the Philippine military not to antagonize China in the relevant part of the South China Sea, according to Defense Secretary Delfin Lorenzana. “When the arbitral ruling was about to be announced, we were all in Malacañang [the Philippine presidential palace] so when it came out, we had this meeting with the president… He said we should not be overly, what they call overly celebrating because we might offend China so that’s what happened,” Lorenzana said in remarks on Friday, according to the Philippine Star. Lorenzana claimed that, as defense secretary, he had a plan in place to send navy ships to Scarborough Shoal, a formation in the South China Sea that China illegally claimed but had not yet begun equipping with military or surveillance assets, as it had in parts of the Spratly Islands. The defense chief also claimed that Duterte ordered government officials to appear somber about the affair and not “overly celebrate” the victory. “The secretary of foreign affairs, Jun Yasay, went on TV and announced that we won that ruling… In that announcement he was very somber and very serious,” Lorenzana noted, stating that Duterte had explicitly ordered him and other senior officials to behave in such a way. Lorenzana’s remarks follow a turbulent week for Duterte, who has made efforts to bring the Philippines closer to China despite his citizens’ near-universal rejection of this strategy. Chinese Communist Party leader Xi Jinping visited the Philippines on Tuesday and Wednesday, welcomed by mass protests demanding China withdraw from the South China Sea and widespread mockery on social media. Xi’s was the first visit by a Chinese head of state to the Philippines in 13 years, an indication of how far from China previous presidents had moved the Philippines’ foreign policy. During his visit, Xi signed 29 joint agreements with Duterte, many involving economic development. Among the deals was an agreement that allowed China rights to oil and gas exploration in the Philippine South China Sea (sometimes called the West Philippine Sea) and one that formally inducted the Philippines into the group of nations participating in One Belt, One Road (OBOR), or the Belt and Road Initiative (BRI), China’s plan to dominate global shipping and transportation. The latter has triggered significant criticism in the Philippines because other developing nations signing onto Belt and Road have found themselves caught in insurmountable debt traps, paying China with their sovereignty. Upon Xi’s landing Tuesday, the Philippine polling firm Social Weather Systems (SWS) published a survey finding that 84 percent of nationals believed that Duterte’s concessions to China were “not right” in the South China Sea, the highest number a poll has published yet. In July, a similar survey found 73 percent of Filipinos wanted Duterte to actively confront China, not cooperate with Beijing.